The ultimate foam anti-fatigue mat. Soft foam core encapsulated in oil and chemical resistant Nitrile material. Slip resistant - raised diamond pattern surface. Fire tested to BS EN 13501-1:2002. Standing in one place while working can take its toll on your wellbeing, you can become tired and end up straining your muscles. This can become dangerous especially when you are working with machinery or are at risk of slipping on substances you work with such as oil. Our heavy duty oil resistant foam matting is the ultimate foam anti-fatigue mat which will help to reduce lethargy and strain on the body. The soft foam core is encapsulated in a Nitrile material which is oil and chemical resistant, making this matting safe for using where slip hazards could be a risk. The slip resistance is aided by the raised diamond pattern surface which proved exceptional grip underfoot. There are two options for the width; 600mm or 900mm and a choice of four lengths; 900mm, 1000mm, 1500mm or 18300mm. 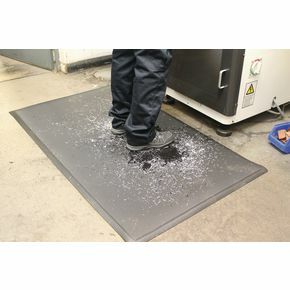 Our heavy duty oil resistant foam matting is ideal for reducing fatigue at work and helping to increase concentration, while also reducing slip risks and they are available with FREE UK Delivery.